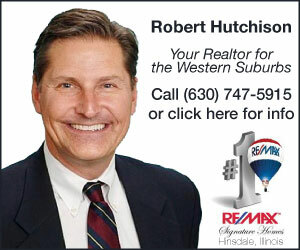 Want to stay out of the cold this holiday season? Head to Navy Pier! 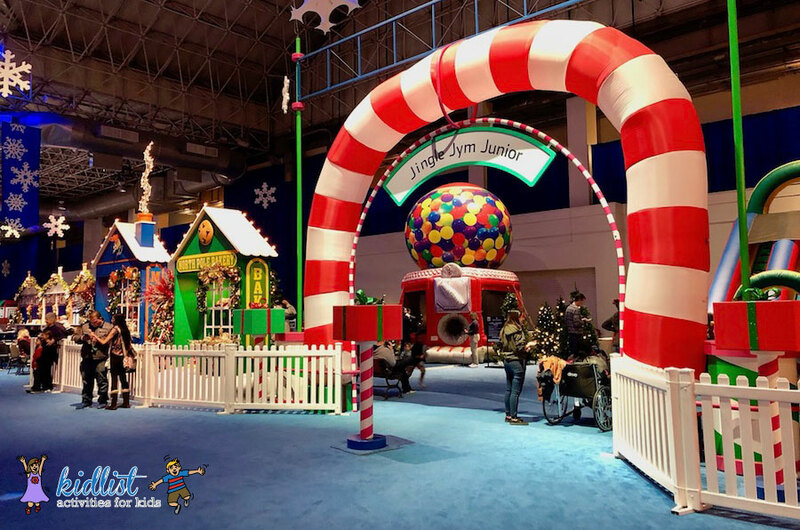 The Fifth Third Bank Winter WonderFest is a cross between an amusement park and indoor inflatable play place, with various holiday photo opportunities. 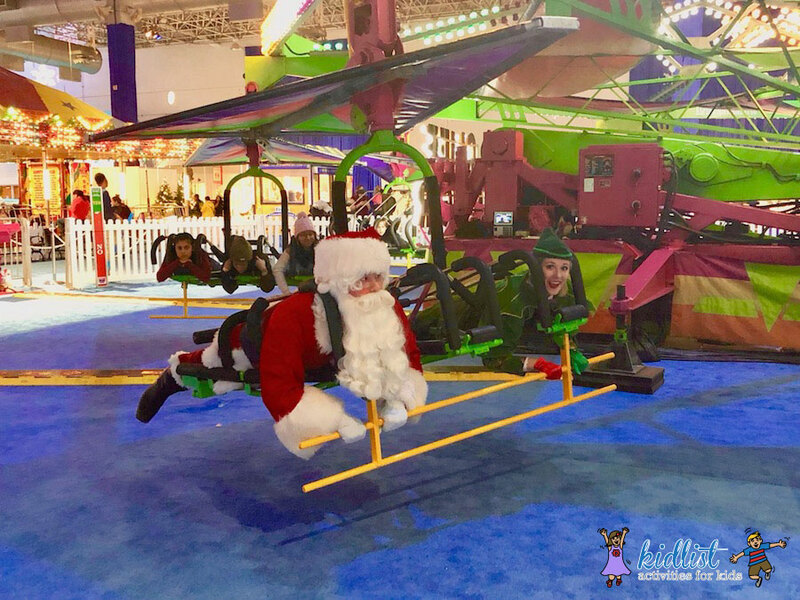 You will find amusement rides for each age group, many inflatable slides and bounce houses, climbing walls, an indoor ice skating rink, indoor tubing on a small hill, and a ride on the Centennial Wheel. This year they added an outdoor lights and music installation, Passage. 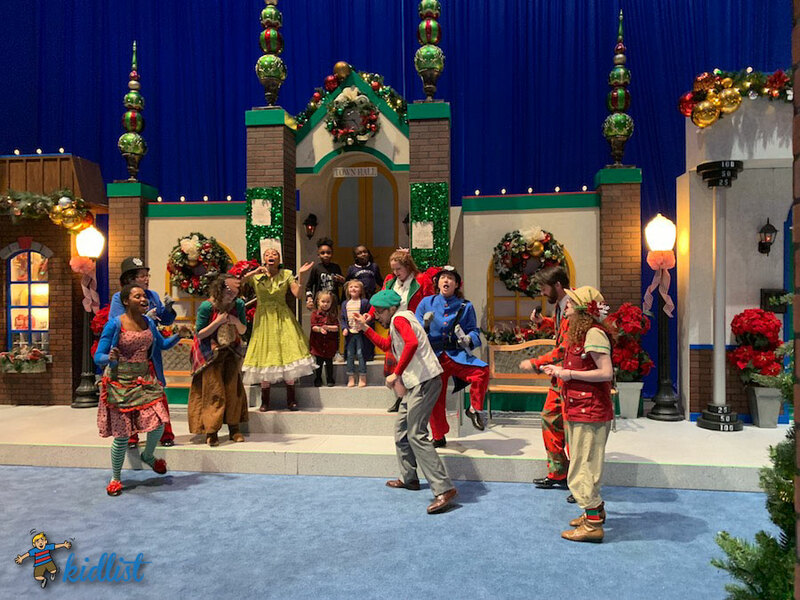 Navy Pier invited our family to attend the Fifth Third Bank Winter WonderFest. We had never been to this event and wanted to check it out to have some fun and share with you! They gave us complimentary tickets, but all opinions are my own. Don’t miss the tips and discounts section towards the end! 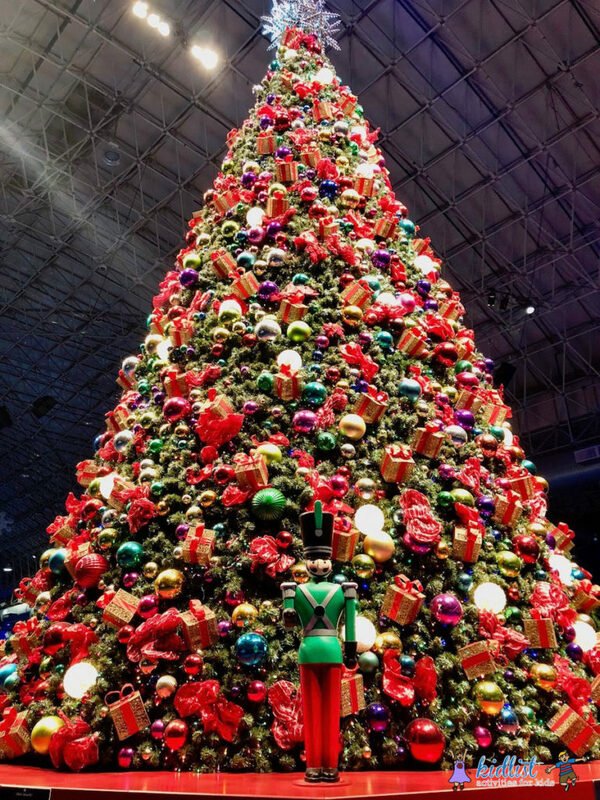 The 42-foot Christmas tree creates a special entrance. 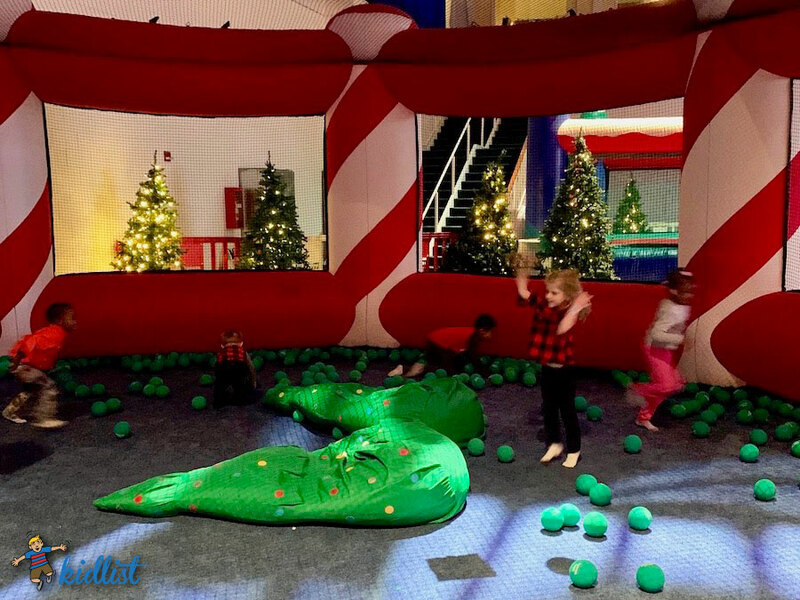 Most of the inflatables are along the walls, while the more adventurous amusement rides are in the center of the ballroom space. There were rides for every age and level of thrill seeking. Click here for the full list of attractions and check out the photos below. Santa and his elf even took a break from photos to enjoy the rides! Rock climbing and mini golf is included in the price of admission. Slide down a 15 foot hill on tubes to get the experience of tubing without the snow (you can see the hill in the background of the photo below). Hockey skates are available to skate on the Chicago Blackhawks Indoor Ice Skating Rink under the lights. General admission starting at $28 (see the discounts section below) for all adults and children over 42 inches tall and under the age of 65. It includes access to all rides and activities and one ticket for the Centennial Wheel. 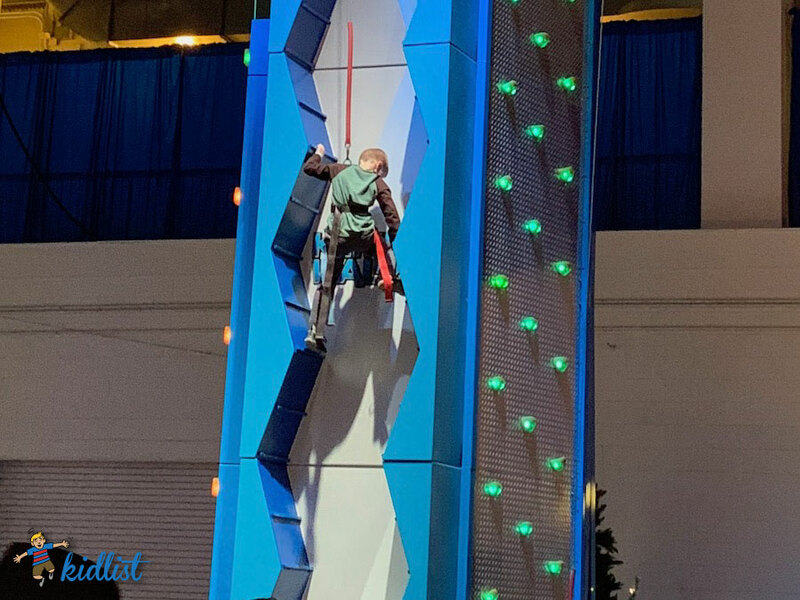 Please note that the Polar Extreme (inflatable obstacle course) has a 200 lb maximum, Cliff Hanger (glider ride) is for people 46 inches tall and up, and Ice Peaks Climbing Walls are for 48 inches tall and up (gym shoes required). 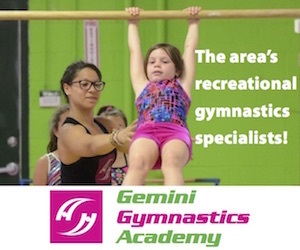 Junior passes are for kids 36 inches to under 42 inches tall. Senior passes are available for guests 65 years old and older. Both are $13 each and you can save up to $3 each by buying tickets online. 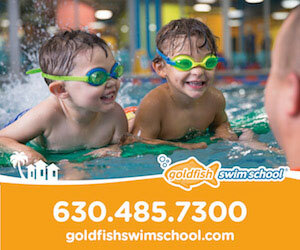 You can find the full list of attractions for the Junior height group on the Navy Pier website. Click here to see the color-coded map and helpful grid. Junior and Senior Passes also includes one ride on the Centennial Wheel. 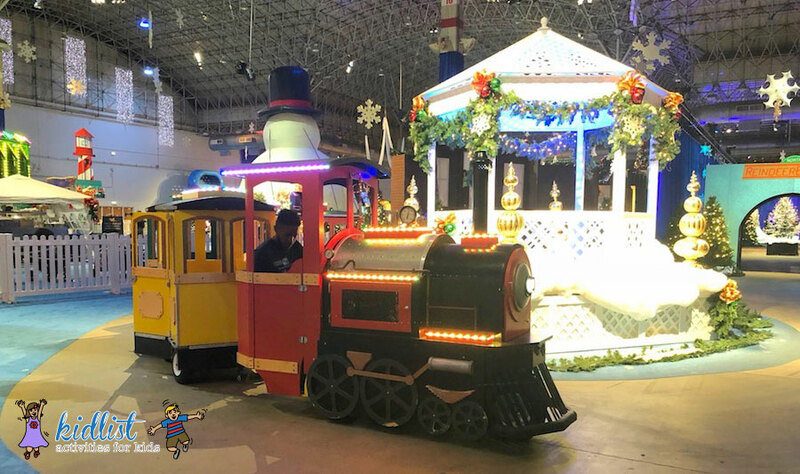 Children under 36 inches tall are free and can enjoy the Arctic Express, Jingle Jym Junior, and carousel (with an adult). Santa and Mrs. Claus were available for photos, but times vary each day. There were signs demarcating the times Santa and Mrs. Claus would be there. There is also a photo package option for all the photo stops throughout the fest. 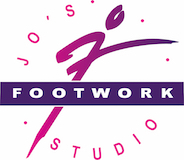 Packages vary from $20-45. As you walk through the WonderFest, there are comedian street performers handing out “tickets” and interacting with the kids. We also stopped to watch carolers sing in the streets of the small villages they have decorated with. This fest had so much to offer. There were a few different vendors spread throughout the festival. They had a variety of small eats including tacos, pretzels, popcorn, hot dogs, chicken tenders, nachos, turkey wrap, and candy options. Drinks options varied from juice boxes, cans of soda, water, and adult beverages, as well. 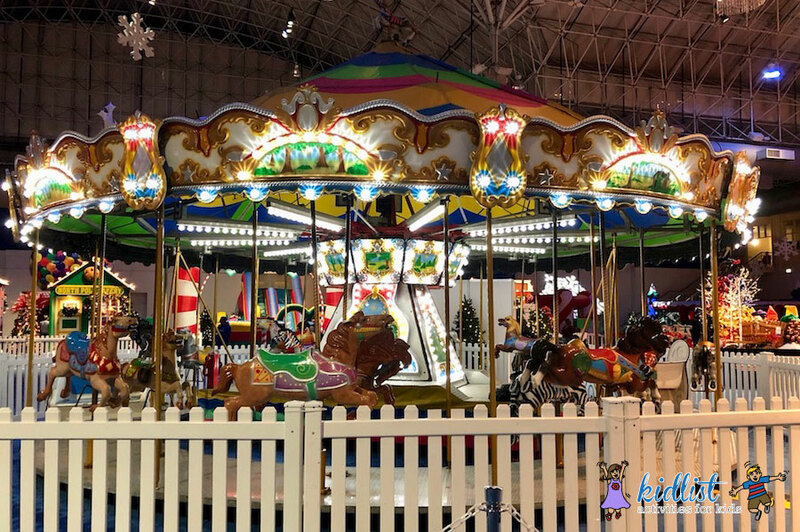 Along Navy Pier’s South Dock from December 7, 2018 – January 6, 2019 is a new whimsical winter art installation, Passage. The installation is a free public art exhibit encompassing light and music. Guests are guided through 20 circles of light that form a tunnel of animation and sound with each step. 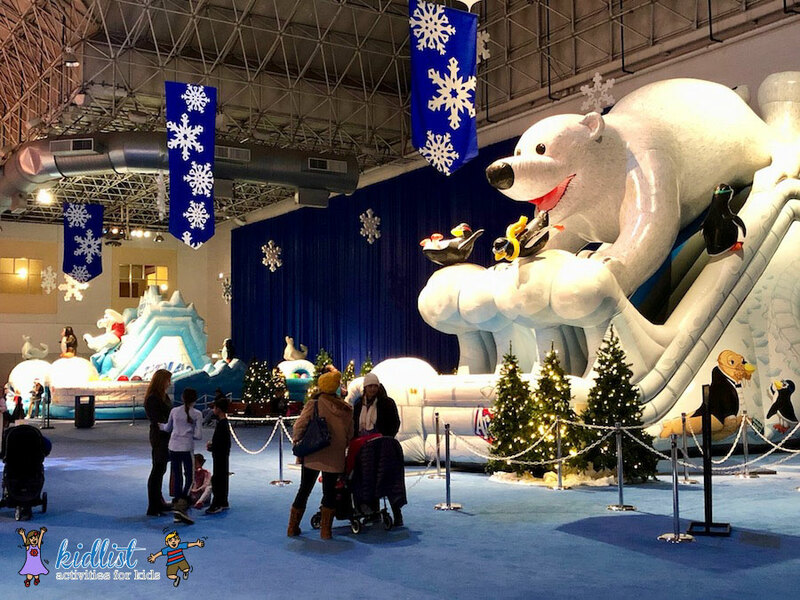 On December 10, 2018, Navy Pier will host special sensory friendly hours from 3pm-5pm at Fifth Third Bank Winter WonderFest. 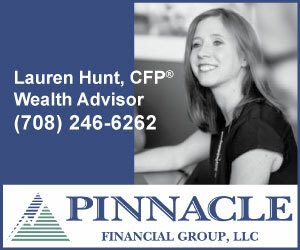 For more information and to purchase tickets, please click here. 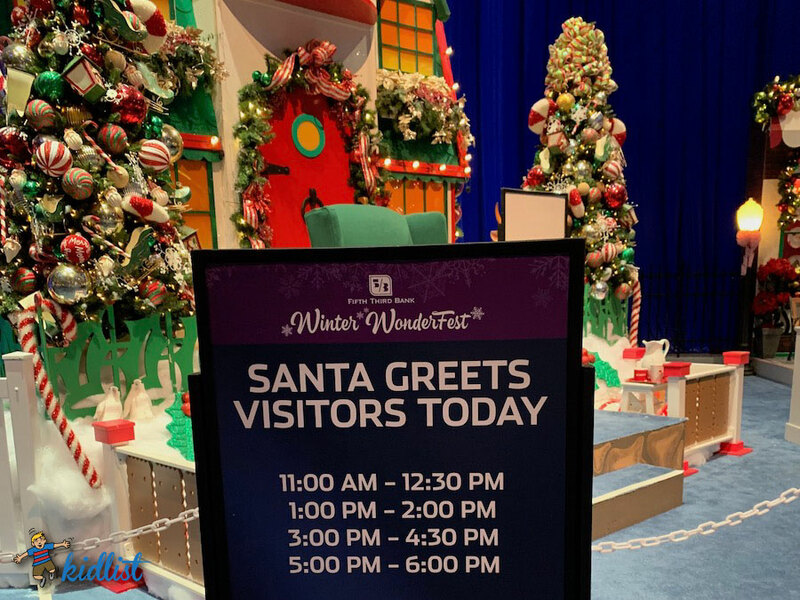 Winter WonderFest is open at 10:00 am daily now through January 6, 2019, however will be closed on Christmas Day. Closing times vary by day. 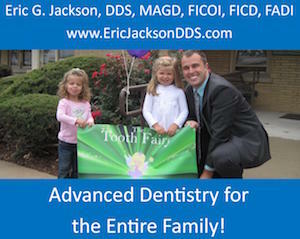 Click here for the full schedule. The least crowded days are Monday through Thursday. We went at 4:00pm on a Friday and there were no lines. 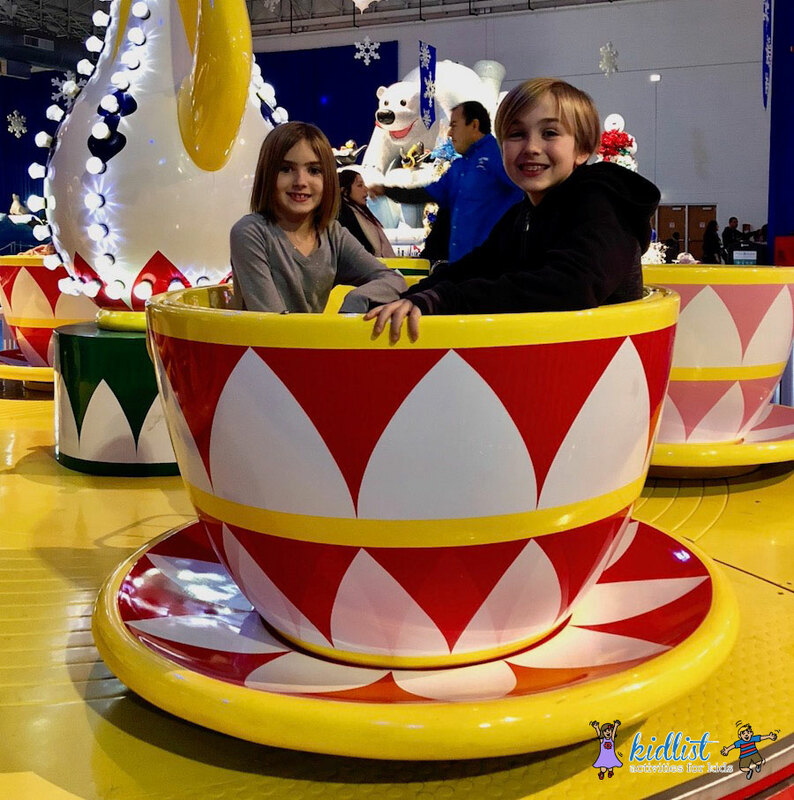 Our kids spent most of their time in the Jingle Gym and riding the train and carousel, without having to wait. However, Friday through Sunday, you will most likely experience longer wait times and when holiday break begins during the week. 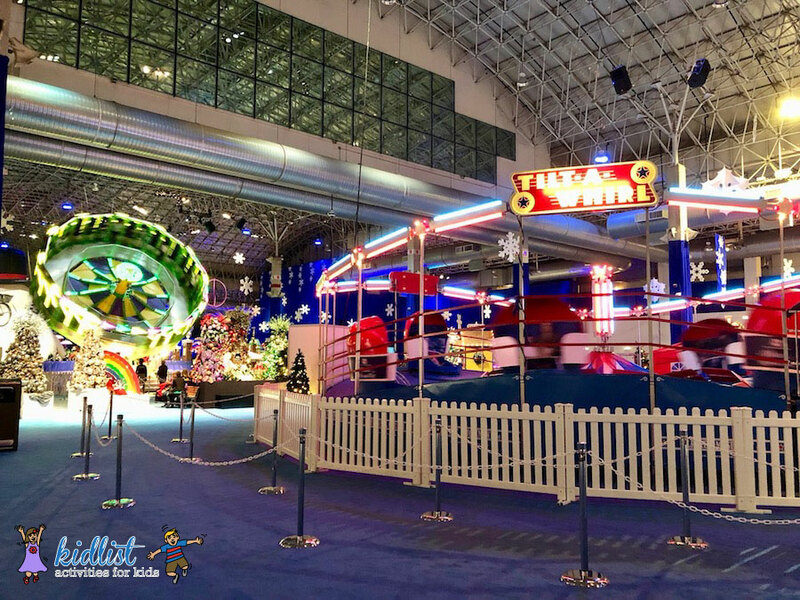 We recommend parking in the Navy Pier East Parking Garage, leaving your coats in the car, and heading to the Winter WonderFest in the Grand Ballroom. Coat check is available, but it’s $4 per coat and can add up quickly. Parking at Navy Pier is $30, but does not have a time limit. Your bags will be searched at the entrance for safety, so to save time bring only essentials. We felt that the food was expensive ($6 for a hot dog). The other options are stepping out to go to another restaurant at Navy Pier, packing food and leaving it in your car for when the time is right, or eating before or after you go. Bringing a newborn to a large event, especially far from home, can cause some hesitation for nursing moms. I was pleasantly surprised what Navy Pier had to offer nursing or pumping moms. Directly outside the stairs to the festival, there was Momava pod. It is a freestanding lactation pod with a locked door, bench, small table (not for diaper changes), outlet for pumping, and motion activated lights. Momava is an app to download on your phone. The app directs you to pod in your area. When you get to the pod, you select your location on the app and it will unlock the door for you. Once inside, you can lock the door and the app will mark your pod as occupied. Active Military and Veterans can present their valid ID at the box office to receive $6 off General Admission and $3 off Junior/Senior tickets, limit four. Right now, there is a Groupon for Winter WonderFest for up to 48% off! Alternatively, you can purchase tickets on the Navy Pier website to receive a discount off each ticket or check out their other special offers. 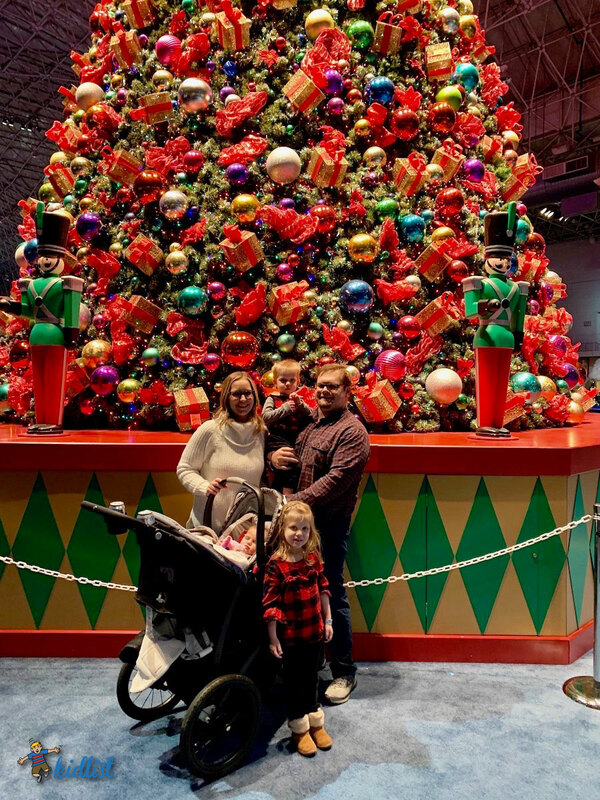 We hope you enjoy Navy Pier’s Winter WonderFest as much as we did! 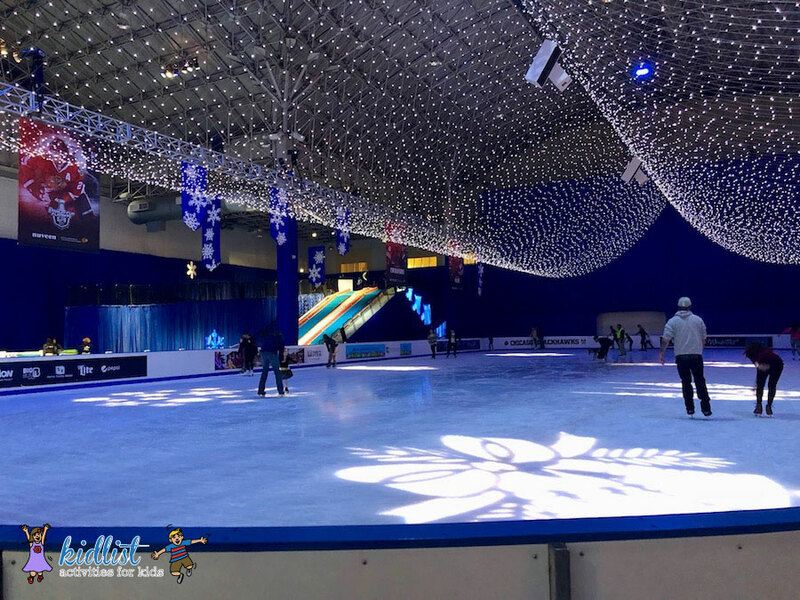 4 Comments on "Review: Winter WonderFest at Navy Pier"
Does anyone know if ice skate rental is included with General Admission? We are thinking of going for the after 4 discount time. Thank you. Yes, skate rental is included with admission. 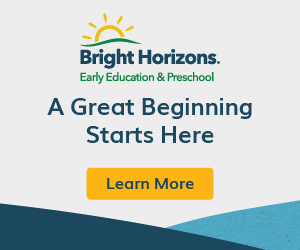 Are all rides included with purchase of ticket? Do I only purchase the tickets and everything is included?or will I need to take extra money besides tickets to spend at the place? Yes, all of the rides are included. There is food for purchase and we saw a cookie decorating table with a fee, but besides that we didn’t encounter anything else that required an additional fee.